﻿Thinking about planning a cruise vacation? ​You have the means for independent travel via the network of airports, train and bus stations, taxis, rental car agencies, roads, etc. This network is designed to facilitate independent travel by providing many sources of information including directions, maps, signs, and route markers along the way. In the US, every building has a unique street address; Google and Bing maps point to the correct location. Monuments, parks, scenic overlooks in the mountains, and many tourist sites do NOT have a street address. Cruise ship docks/berths do NOT have a street address. If you use “93 Berth, San Pedro, California 90731” to search Google Maps, Google will point to the wrong location, a dock 1.3 miles from berth 93. When a site does not have a street address, try searching Google Maps using the name of the site. Enter the name of a city/province(state)/country. Google and Bing will find any city in the world. Searching by name works well for airports, train stations, famous landmarks, and many tourist sites. For example, search maps for “Spanish Steps, Rome, Italy”. The map points to that location and provides a lot of useful tourist information. However, there are problems searching for tourist sites by name. Names might not be unique. The “same name” may be used for different points of interest. There may be “different names” for one point of interest. The site might have an “official” name and several “common” names. In the Greek Isles, tourist sites are often named in ancient Greek, old Greek, traditional Greek, etc. using entirely different words to describe the same location. Google and Bing maps might not find the location or point to the wrong location. Cruise ship terminals are difficult to find. If you search for “QEII Cruise Terminal, Southampton, UK”, Google maps point to “Ocean Terminal” one mile from “QEII Cruise Terminal. Microsoft Bing points to the center of Southampton 1.4 miles from “QEII Cruise Terminal”. GPS coordinates solve ALL the problems of searching maps by street address or by name. Precise location of any point on planet earth whether it is on the city streets, in the remote mountains, or in the middle of the ocean. Google and Microsoft Bing maps ALWAYS find the exact location for GPS coordinates. GPS is the perfect, easiest, and 100% reliable way to find anything on Google or Bing maps. Where/How to Get GPS Coordinates? The GPS data is saved in the photo EXIF file and can be read using photo editing software. 2) Right click anywhere on the map. I right clicked on Vatican Museums in Rome. I right clicked on the Vatican Museums in Rome. 3) A menu will appear as shown at right. 4) Select “Directions to”, or “Directions from" or “Add to route”. 5) Vatican Museums will now be shown on the map as a letter such as “A”, or “B” because it is now part of a travel route. 6) Right Click on the letter “A” or “B” and select “Show details” from the menu. 7) A window will appear showing the GPS coordinates. That window is shown at far right. 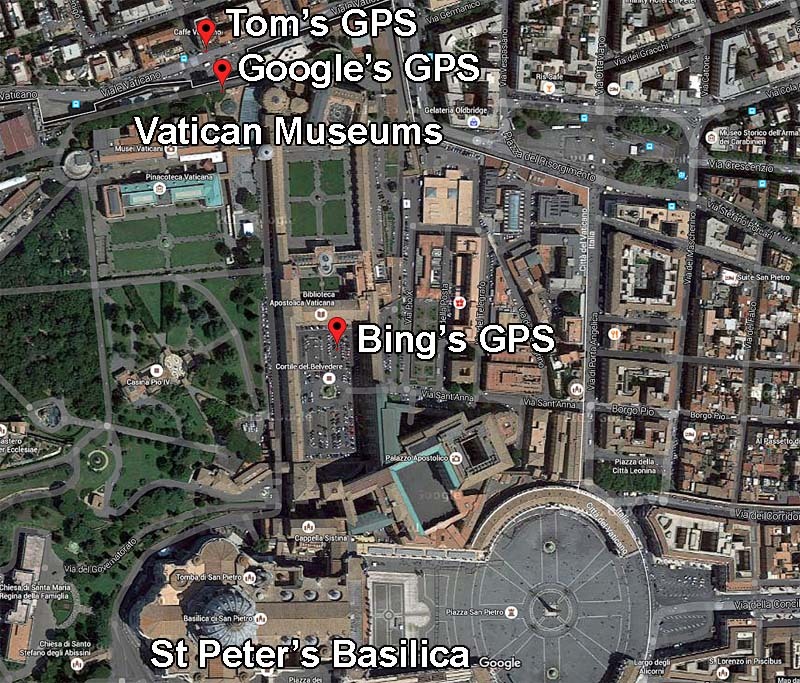 Google and Bing maps reported different GPS coordinates for Vatican Museums. The person designing the map selects the GPS coordinates for the Vatican Museums. I would have selected a different location. Tom's GPS: I want a location facing the Vatican Museums entrance so I can map a walking route and use Google street-view photos to see the entrance and recognize it as I walk to the museums. Google's GPS: Google points inside the entrance to the museum. It's a good location, but it's not on the street. Bing's GPS: I can't figure out why Bing chose these GPS coordinates. It's a parking lot next to the museums. Google maps have excellent coverage of major tourist sites around the world with street level photos. Unfortunately, Bing maps have limited coverage of many world tourist sites. To access the Google street-level photos, drag the “little yellow man” icon from the lower right corner of Google maps and place it on top of “Tom's GPS”, rotate the street view with your mouse and you will see the entrances to the Vatican Museums. Photo below. Personalize vacation travel by selecting GPS coordinates for your maps and use Google Street-Level Photos to study places you will visit. If you are renting a car, pick GPS coordinates for the parking lots in the cities you wish to visit so that you don't have to waste time looking for a place to park. If you are walking, select GPS coordinates on the street in front of the entrances to the museums, churches, etc. you plan to visit so that your map will direct you to the front entrance of the building. If you are taking a train, pick the coordinates for the entrance to the station. If your are riding a bus or the metro, pick the coordinates for stops you will use. can travel independently with knowledge and confidence to visit tourist sites. Both Google and Bing maps accept this for input data and they output data in this format. Both Google and Bing maps accept this for input data. Google Maps also use this as a format for output data. 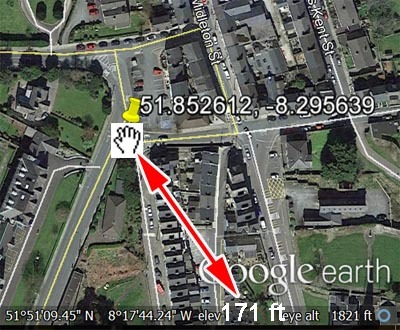 Copy and paste the coordinates from a document or website into the map search box for Google or Bing maps. 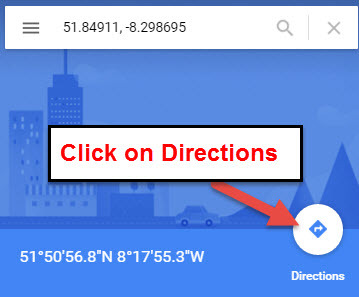 You can also type the coordinates into the map search box for Google maps. This does not work for Bing maps. Measure distance and travel time for walking, car, bus travel, etc. Once you have GPS coordinates, you can view tourist sites from different different perspectives and explore the possibilities for places to visit on your walking tour. 57 Guides that contain 1541 Pages, 788 Maps, and 1405 Photos. My guides are packed with GPS coordinates and are designed to help you plan your travel routes and create your own maps. 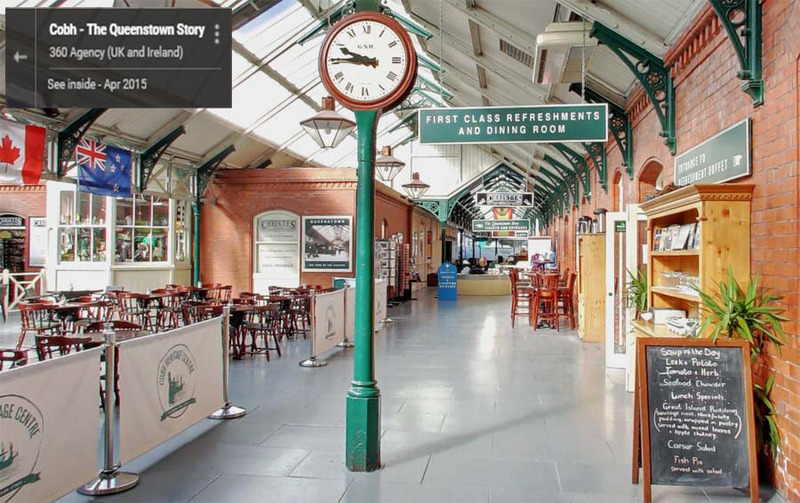 The example below uses information from Part I of my Cork-Cobh-Ringaskiddy Ireland Cruise Port Guide. Open Google Maps in one window and this web-page in a second window. Copy and paste the first set of GPS coordinates (for the cruise ship dock) into Google Maps and press enter. Click on Directions. A new window appears. Google assumes the location we entered was the destination for our route. Click on the up/down arrow to make the location our starting point. A new window will appear. Enter coordinates for the 2nd stop on the route, press the enter key. Enter the coordinates for the 3rd stop on the route and repeat until all coordinates are entered. The walking tour route map at right appears. Be sure to click on the walking man icon at the top of the blue menu. You could chose a travel route by car, bus (if local buses service the area) or walking. Google also often shows a travel route by bicycle. This walking route takes 20 minutes and is 1.5 km (0.9 miles). 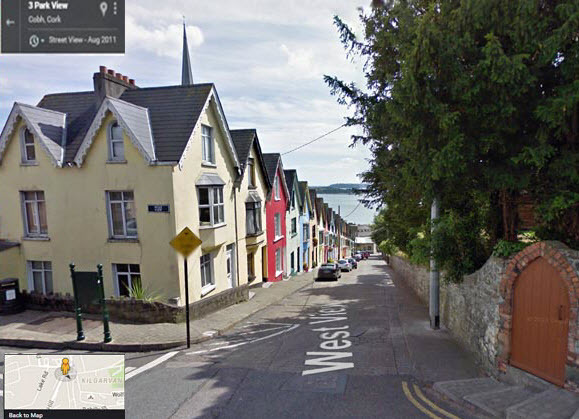 Google changes the name of the GPS Coordinates for the cruise ship dock from 51.84911, -8.298695 to the name of the road “Westbourne Pl, Cobh, Co. Cork, Ireland”. Google uses names of streets and nearby points of interest on route maps. The “Deck of Cards” is renamed to “Cobh Medical Center” because it is near the medical center. “St Coleman's Catholic Cathedral” becomes the “Rock Cottage” on the Google route map. I have added text to the route map to show where to click for Earth or Map view and the location of the “little yellow man” icon for Street Photos. Drag the “little yellow man” icon from the lower right corner of the map and place it at the base of the down-pointing red arrow, the starting point for our walking route. The street-level photo at right appears. You can see a cruise ship over the roof of the building. Use the mouse to move the image face Heritage Center. Every Google street level photo has a tiny menu on the top left corner. I enlarged the menu (photo right) to show the left pointing white arrow. Click on this white arrow to switch back to the map view of the route. This allows you to toggle back and forth between street level photos and the route map. You will see an arrow on the pavement in all street-level photos. Move the arrow to walk to the building. Move the arrow around until it is at the front door of the building (photos below). Click on the arrow in front of the door to walk into the Heritage Center building to explore it. Amazing!!! ​Click on the left-facing white arrow in the menu on the photo to return to the map route. Change the map view to “earth”. Enlarge the section of the map to view the second stop on the walking route (photo below left). You can see the walking route along the streets as a series of light blue dots. Note: the 2nd stop on our route is NOT on the street. Google is smart enough to recognize this stop is off the public road and shows a dashed line to the correct location of the 2nd stop. Unfortunately, Bing maps show the wrong location for the 2nd stop. Bing does NOT show off-road locations on route maps. Bing changes the location of the GPS coordinates to show the nearest location on the public road. The 2nd stop is behind the White Star ticket office, near the wood dock where passengers boarded a boat to take them to the ill-fated Titanic anchored in the harbor. 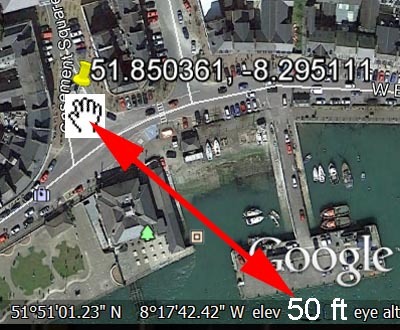 ​I have also marked up the map to highlight the 3rd stop on our walking route – the Lusitania Memorial in the center of Cobh Town. 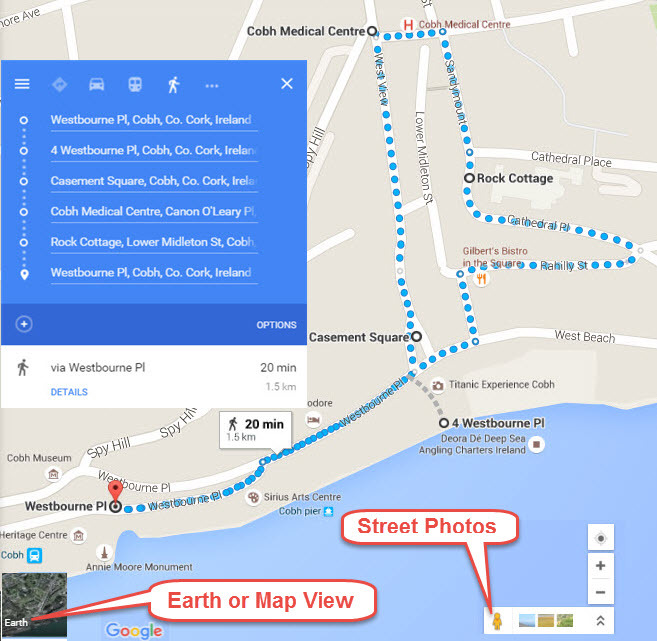 Drag the “little yellow man” icon onto the map and you'll see great street photos of the center of Cobh Town. 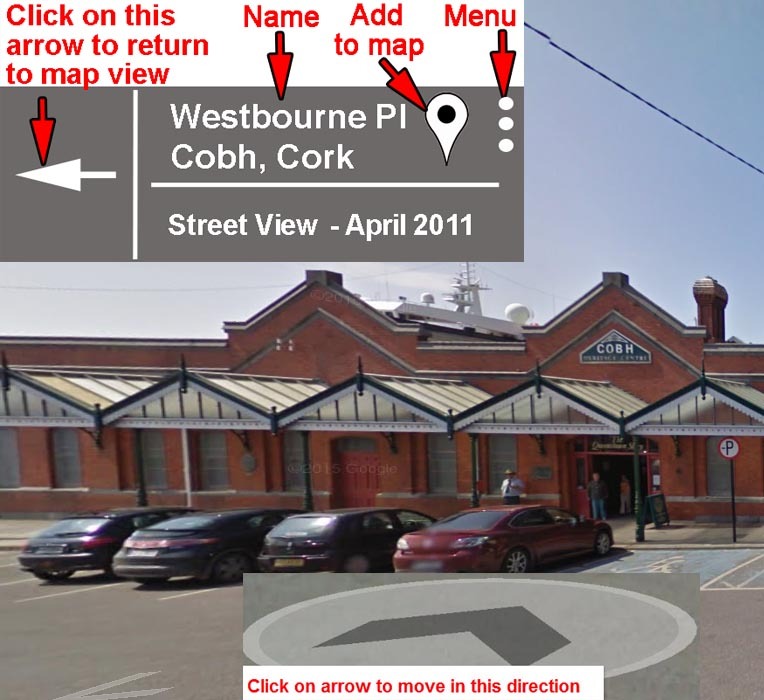 Switch back to the route map and drag the “little yellow man” icon onto the 4th stop which Google names “Cobh Medical Centre” because it is near the Medical Center. This location is called the “Deck of Cards” because it is the top of a hill looking down a steep incline on West View Street at 23 colorful houses. It's a postcard photo opportunity. See the Google street level photo below. Many people walk up West View Street from the Lusitania Memorial to take photos of the houses and the harbor. If you are mobility challenged or an old guy like me, you may want to know how high this hill is so you can decide whether you have the energy to walk up West View Street to the "Deck of Cards". Fortunately, Google has a separate Earth Map program that can measure elevation above sea level to determine the change in grade as you walk up West View Street. ​Measuring elevation above sea level to judge the difficulty of walking up steep streets. This is important for mobility challenged people. BEFORE downloading any software program, CRITICALLY REVIEW the website where you will download the software. The problem is there are dozens of websites that “pretend” to be a Google website offering free downloads of Google software. Many of these websites contain malicious software that can infect your computer. Open the Google Earth map program. When you move your mouse around, the cursor location is shown as a white gloved-hand. The elevation above sea level at the cursor is shown at the bottom right corner of the map. Move the cursor on top of the yellow tack at the GPS coordinates. The elevation above sea level is 171 feet. Move the cursor on top of the yellow tack at the GPS coordinates. The elevation above sea level is 50 feet. Walking up West View street to the Deck of Cards is an elevation change of 121 feet. That's like climbing a 12-story building. If you are concerned about walking up this steep street, consider walking the switch-back roads to the Cathedral and then walking over to the “Deck of Cards”. Another option is to take the little red train tour of Cobh from the White Star ticket office. The train travels everywhere, stops for photos, and offers a “stress-free” way to ascend the hills for great views of the harbor and most of the sites in the town. Viewing a point of interest on road, terrain, aerial, and earth maps. This example is from my Azores (Ponta Delgada) Port Guide. The Azores Islands are spectacularly beautiful with majestic mountains, rolling hills, and volcanic craters. Copy and paste the GPS coordinates from the table above into Google maps. A window appears in the upper left corner of the map. Shown at left. This travel route is 14.4 km and takes a minimum of 25 minutes. Our guide stopped everywhere for photos so it took a lot longer than 25 minutes. Google renamed all of the GPS coordinates. Note the menu on the upper left corner shown as three horizontal lines. Click on the menu and the choices appear as shown at left below. I clicked on Terrain and the map below right appeared. ​On the lower right side of the earth view map, there is a menu (shown above that allows you to “Tilt the view” to see the volcanic crater at a slight angle. The map at left is "tilted" to emphasize the landscape around the volcanic crater. 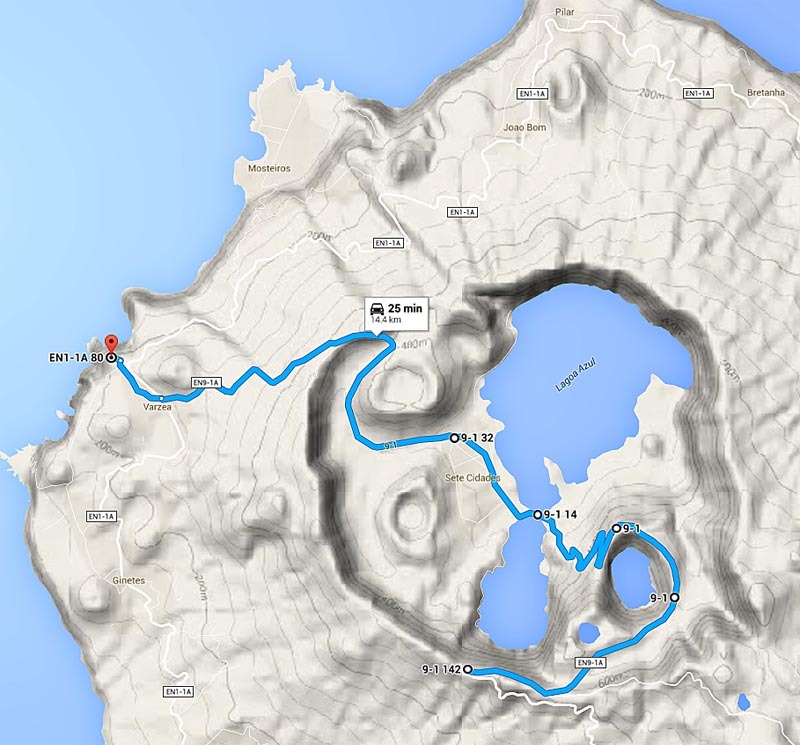 Google maps provide an incredible range of options to view and explore the mountains of the Azores. I encourage you to change the magnification to examine the detail, view the area as a road map, a terrain map, and an earth map. Drag the “little yellow man” icon onto the map to see the street photos of these incredibly beautiful mountains and the caldera. The case for using Google and Bing maps to plan vacation travel. For centuries, maps have been the key to exploration and discovery. Paper maps are OK, but they're fixed; you can't change them. List points of interest you wish to visit. Find them on Google and Bing maps and record the GPS coordinates. Become familiar with the sites you plan to visit so that you can travel independently with knowledge and confidence. Save your maps to your tablet and print out paper copies to carry with you. Planning doesn't get much better or easier and you can do it from the comfort of your home using your computer. I hope this information is helpful and wish you a great cruise vacation. © Copyright 2017 Thomas Sheridan ﻿www.TomsPortGuides.com﻿ All rights reserved. Thinking about planning a cruise vacation?